Mr Damion Bateman, Founder and Managing Director of Kimma Vending, set up Kimma Vending with a view to providing customers with a first class vending machine service. Kimma Vending are a professional vending company based in Glasgow which has grown rapidly to become a market leader in supplying vending solutions across Scotland and Western Europe. 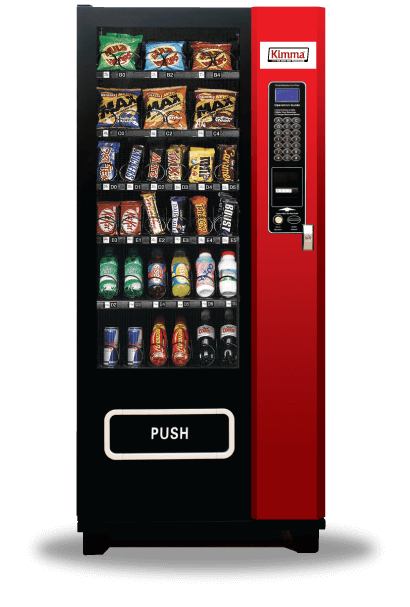 We can provide Free Vending Machines and free servicing for either employees or customers alike with no fuss or hassle. Kimma caters for all your vending needs in snack foods and canned or bottled drinks through our modern, high tech vending machines. KIMMA Vending takes quite a few effective measures included in the design of inner structures in order to prevent machines from burglary, intentional or unintentional fierce hitting, damage and other machine vandalism on the delivery door. How to Operate Our Machines? How to make your selection depends upon many elements. Among them are where the machine will be put, What kind of items will be sold, which payment mode will be employed ,how much would you like to invest, and machine colour etc. Kimma Vending are a professional vending company based in Glasgow which has grown rapidly to become a market leader in supplying vending solutions across Scotland and Western Europe.